World Superyacht Award winner Adam Voorhees has announced the first project to be designed entirely by his studio, a major refit of the sloop Sleighride. Voorhees, who was named Young Designer of the Year at Boat International Media’s World Superyacht Awards in 2010, originally worked with the client on ideas for a new yacht, subsequently considering the possibility of refitting an existing boat. The new owner has asked for the refit, at Westerly Marine in California, to incorporate automated sail handling systems, so that he can sail solo, plus comfortable, luxurious spaces for when he entertains friends and family. The salon and the galley, which had been small and tucked away forward to the saloon, were the focuses of Voorhees’ attention. 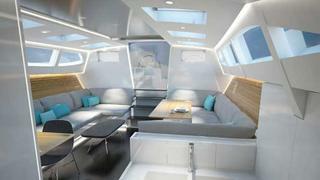 He intends to take down some of the major bulkheads to connect the galley and saloon, creating one continuous space. The interior will feel cool, natural and open, with multiple skylights. It will be further enhanced with custom furniture commissioned by the owner. In terms of style and materials, Voorhees adheres to what he calls an ‘essential aesthetic’. When finished, Sleighride will have a 25 metre LOA with a 5.6 metre beam, weigh only 19 metric tonnes, and have a 230 square metre upwind sail area. Originally designed by Sparkman & Stephens and built by Goetz, she features prepreg carbon construction, water ballast, a generous sailplan, and separate entertaining and working cockpits. The yacht has always been a fast daysailer, reaching 24 knots on her first sea trial.